Pilon, 20, was drafted by the Capitals in the third round (#87) of the 2016 draft. He signed a three-year entry-level contract on March 30th, 2017 at $925,000 AAV. Pilon is waivers-exempt for the coming season. Pilon has spent the last three seasons playing in the WHL, where he has posted fairly impressive offensive numbers. He started with Kamloops for the 2015-2016 season where he registered 15 goals and 32 assists. He totalled 20 goals and 45 assists the following year. Pilon ended his the 2016-2017 with a brief stop in Hershey, playing in one playoff game. During the 2017-2018 season he registered 18 goals and 26 assists in 39 games before being traded to the Everett Silvertips where he added another 16 goals and 20 assists in 30 games played. Pilon had a good year from start to finish, which included a mid-season trade from Kamloops to Everett. He finished the regular season with 34 goals and 46 assists in 69 games played. He added another 11 goals and 17 assists in 22 postseason games. Pilon’s 2017-2018 season included three hat tricks, Including a postseason hat trick on March 24th against the Seattle Thunderbirds in Game 2 of the Western Hockey League (WHL) playoffs. The following is a compilation of our month-by-month prospect reports for Garrett Pilon during the 2017-2018 season. The small skilled center is off to a good start with five goals and eight assists in 15 games. But probably the most notable part of Pilon’s game is his shooting stats. He has 63 shots in 15 games, that’s over four shots a game. Pilon is not known for his shooting, but his passing. He made comments in the summer on how he wanted to be more of a shooting threat to round out his game. So the fact he’s doing just that is promising. And you would have to think his 7.9 shooting percentage will have to rise a bit. Pilon has had a great November. After recording 13 points in his first 15 games played, Pilon has put up 22 points over the following 10 games! He’s totaled 35 points in 25 games, good enough for 18th in the WHL. And that’s on a team that’s 17th out of 22, so it’s not exactly a powerhouse team. He leads his whole team by 11 points. Something else that’s super impressive about Pilon’s season so far, is he’s racked up 130 shots (over five shots a game), which is tied for second in the whole league. This is promising for a player that was considered too much of a pass-first center. Pilon had a decent December, scoring four goals and two assists in 12 games played during the month. He now has 17 goals and 24 assists in 37 games played this season. Pilon still leads the Kamloops Blazers in goals and assists. Pilon continues to shoot the puck, with 192 SOG. The next closest Blazer has 113 SOG. A potential soft spot in Pilon’s game is his faceoff percentage, which is currently 48.1%. Pilon raised a few eye-brows during the Capitals 2017 Development Camp, so it will be interesting to see his progression when he returns for camp this summer. Garrett Pilon opened the 2018 calendar with a goal and an assist against the Victoria Royals on 1/6. 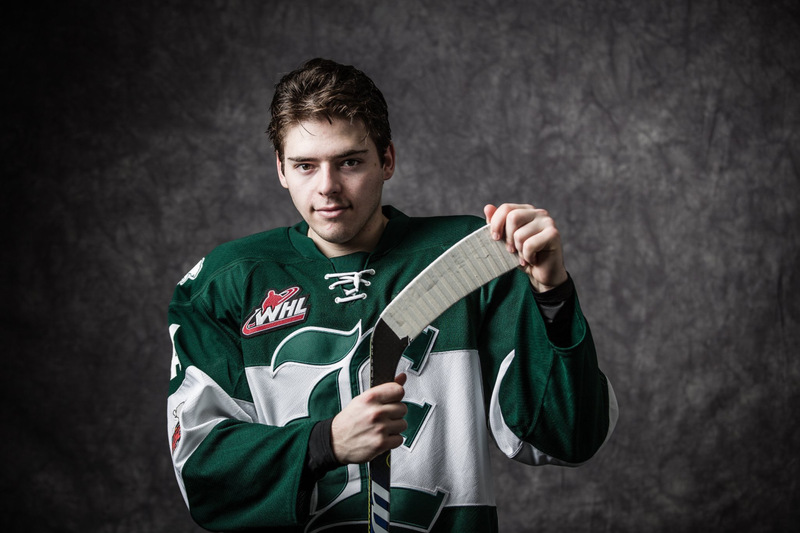 On January 7, the Everett Silvertips acquired Pilon in in a four-player transaction with Kamloops. Pilon, 19, led Kamloops in scoring as an alternate captain through 39 games this season with 44 points (18g-26a) and was tops on the Blazers in goals (18), assists (26), power play assists (13), power play points (17), shorthanded goals (2), and shots (205). In January Pilon totaled six goals, including a hat trick on January 13th, his second “hatty” of the season. He also tallied 10 assists for a total of 16 points in January. Pilon now has 23 goals and 34 assists in 49 games this season. Pilon is currently centering the second-line for Everett. Look for Pilon to possibly return to Hershey this spring, like he did last season, but also look for him to be on the Hershey roster in September. Pilon drew a long, extended look from Capitals coaches during last season’s training camp, being one of the overall last cuts. He will most likely start the season in Hershey, but could see a call-up at some point, whether for a game or two to get some experience, or potentially for a backup or 4th line emergency. This entry was posted in News and tagged Caps Prospects, Everett Silvertips, Garrett Pilon, Jon Sorensen, Kamloops Blazers, Washington Capitals Prospects. Bookmark the permalink.